If you follow my Instagram feed, you’ve likely seen some pictures of our newly renovated living room/dining room. We stripped wallpaper, painted walls, removed carpet and refinished the floors. After the larger tasks were done, I started redecorating and taking care of some of the smaller projects to help make this room complete. 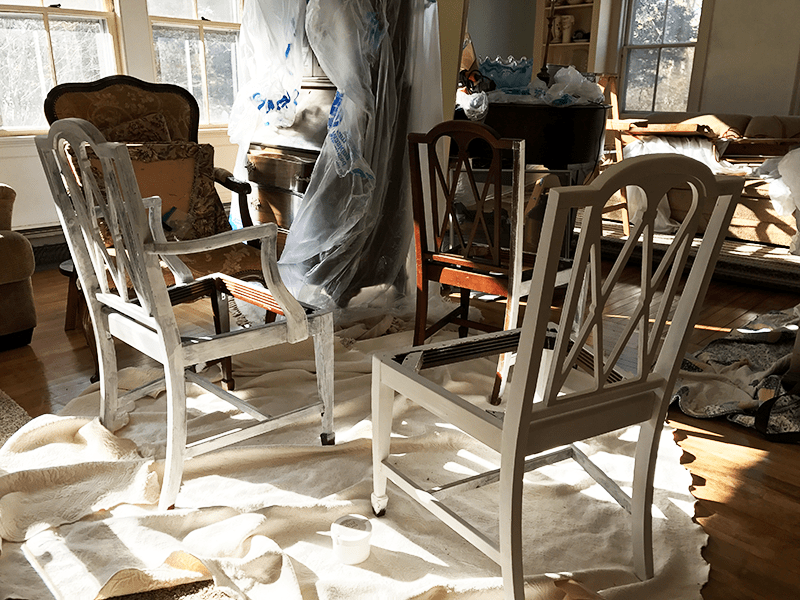 The first thing you want to do is give the chairs and table a very thorough cleaning with a degreaser (all purpose cleaner is fine) and allow them to dry completely. Dust and grime will prevent the paint from adhering well to the surface. Make sure to shake the paint can well, to prevent settling at the bottom. 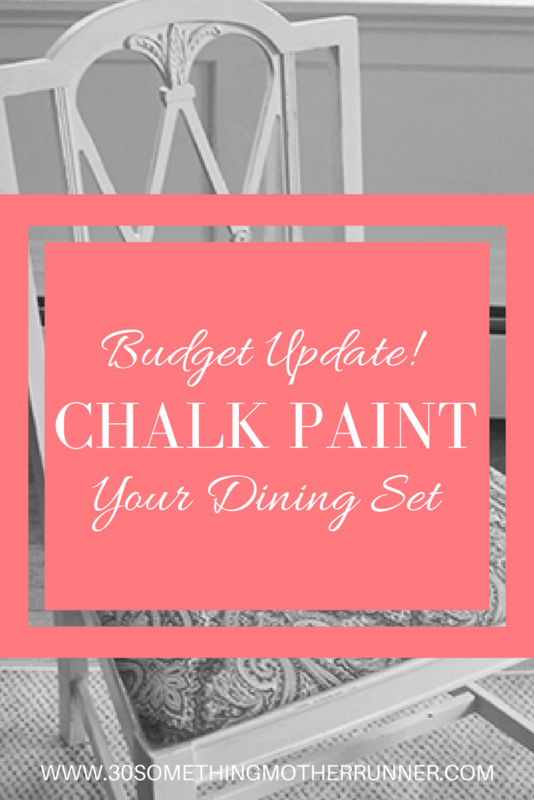 Chalk painting of the dining room chairs in progress! 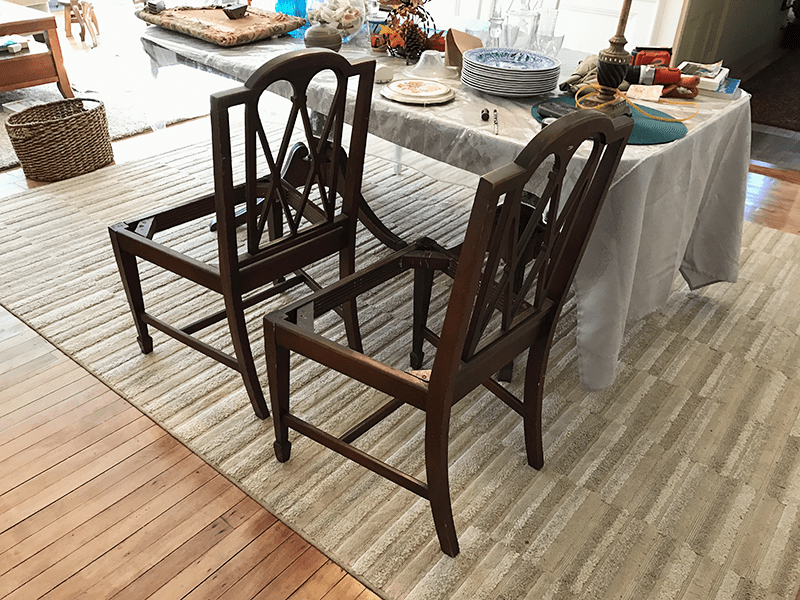 If you choose to distress, take the sandpaper and lightly go over any areas that would normally get distressed like the edges of the chairs or other decorative areas (see picture below). When you are done distressing, make sure to dust off all of the paint that has been sanded off with a damp cloth and let the piece dry completely before applying the polycrylic. 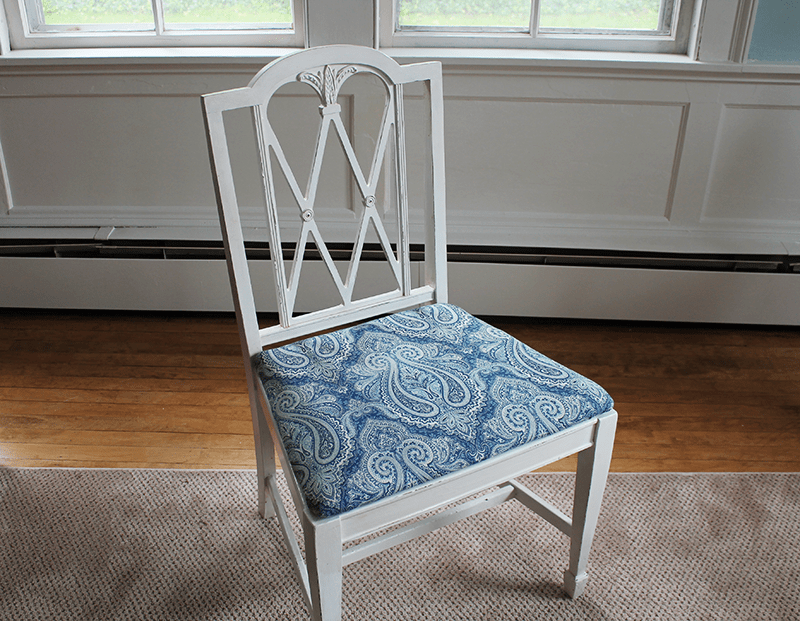 Chalk paint and a newly upholstered cushion makes this chair look brand new! Distressing the chair after chalk painting helps bring out details in the woodwork. I recommend 2-3 coats of polycrylic depending on how much use your dining set will get. I did 2 coats for mine since we don’t use it every day– only on special occasions. You can always add another coat later if you change your mind! I recommend letting the furniture sit unused for a few days to give everything time to cure. 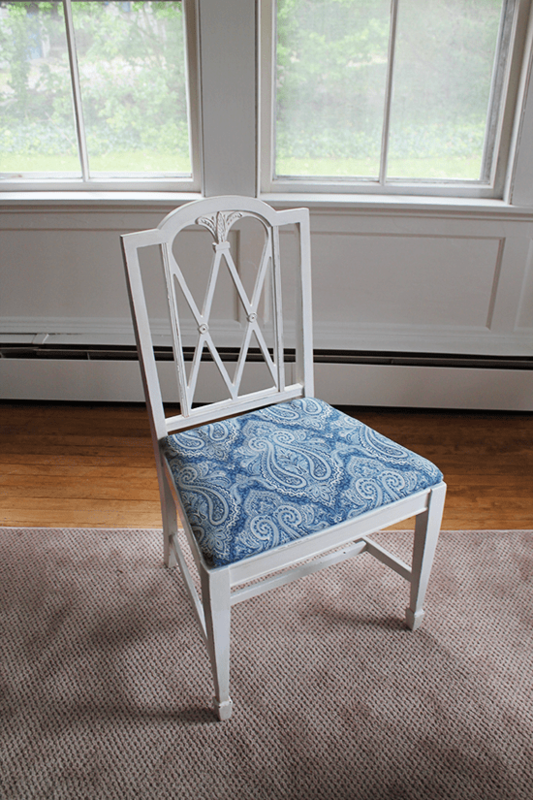 If the fabric on your chairs is outdated, it’s super easy to reupholster the cushions. Chalk paint can be used to breathe new life into so many different pieces of furniture and accessories. 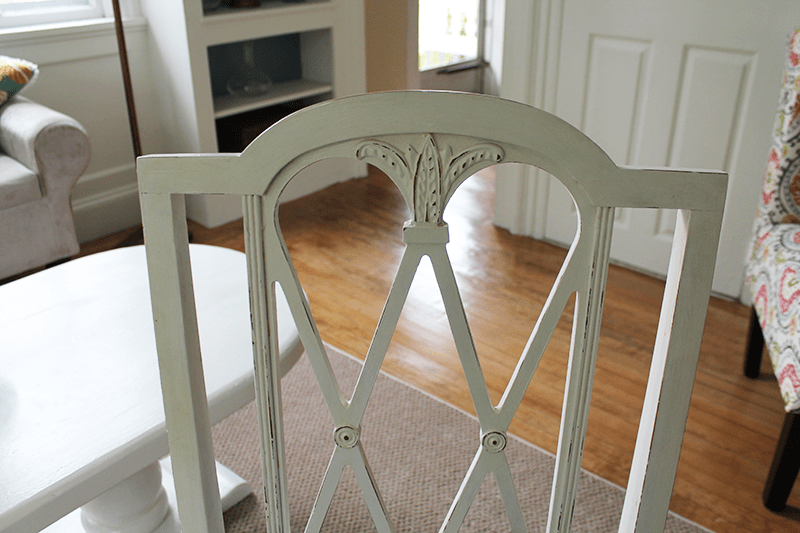 I’ve even used chalk paint on my wicker porch furniture— it turned out beautifully! 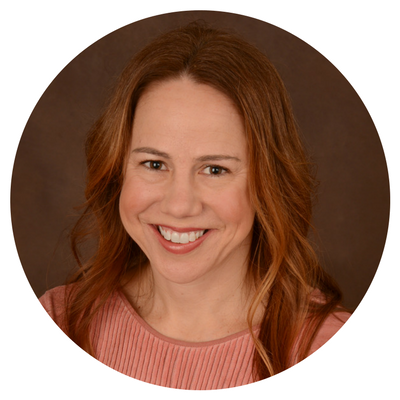 Previous Post: « Childhood Cancer Awareness ~ Proud to be a St. Jude Blogger Ambassador!